Here in Vienna we actually get a full compensation for the terrible summer. Maybe you guys in the US can't belive it, but in Europe we had the probably most awful summer in decades - rain, rain, rain and cold weather. But now it is indian summer, and the "summer" dominates". You can sit outside in the evening and get sunburnt when you stay out around noon. It's not too hot, but just perfect. Wonderful! Therefore, this week's TWD-recipe, The Apple-Nut Muffin Cake, did correspond perfectly with the calender - but not so much with the weather. Katrina of Baking and Boys has opted for this wonderful autumn-recipe. 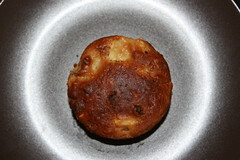 This is a good, in my perception almost classic, apple-cake recipe. Nothing too extraordinary, nothing too difficult. Apples, nuts, raisins, that's it. Add some oats and you get an interesting tiny crunchy texture. 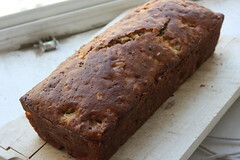 Go to Katrin's page to find out about the recipe, or have a look into Dorie's book on p. 37. I have no square pan, so I made it in my loaf form (and additionally one muffin, to have a "test-piece") and it did work out fine. Funnily, when the cake was already in the oven I figured out I completely forgot to add the butter. But to my surprise - I didn't miss it at all! Does this work with all cakes? Or was I just extremely lucky? The fact that it worked without butter is a bonus! I will have to try this. I love that you forgot the cake. I have been cutting down on the butter or subbing oil in a smaller quantity and so far, I have had good baked goods. I must try this without the butter. I love that you made this in a loaf pan. I think that would be perfect! It is getting cold here, so I would welcome some warm days! Im glad your getting some nice weather!!! Im glad you enjoyed the cake too! I loved it! We are having the best fall weather...75 and 80 in temperatures....today is changing though..the wind is blowing and the temps are dropping!! 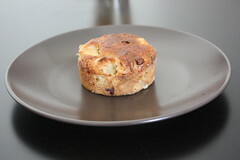 great idea to make a muffin "tester" so you dont have to dig into the loaf. lol.